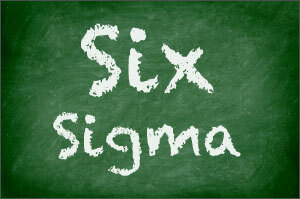 Six Sigma is a technique used to improve overall quality of production output. Originally developed by Motorola, the six sigma process is used to remove causes of variation and defects in manufactured products, and is a universally recognized as an important Lean Manufacturing concept. Six Sigma, as a whole, relies on several other quality management processes to function, including statistical methods such as data collection, charts and tables. When companies implement six sigma, projects generally involve a defined sequence of steps and quantified targets. The targets could be product quality, production process, financial conditions, or a number of other set goals. Generally speaking, if an organization can measure the "defects" in a process, then they can systematically identify ways to reduce or eliminate those defects. The goal is to be as close to "zero defects" as possible. In the quality management world, "Six Sigma Quality" is defined by a process that produces no more than 3.4 defects per million opportunities. An "opportunity" may be defined as the chances of the products or processes not conforming to, or meeting , the required specifications. This means that six sigma quality management demands that a process be as close to perfect as possible. Six Sigma projects can follow two different, five-phased methodologies: DMAIC and DMADV. DMAIC is used mainly for projects aimed at improving existing manufacturing processes and DMADV is used primarily for projects aimed at creating newproduct or process designs. The Six Sigma process is an important process in lean manufacturing and quality management. Check out some of our lean manufacturing tools and 5S items. Get your FREE LEAN MANUFACTURING PowerPoint for a comprehensive Lean Manufacturing resource.